Drivers are small programs or files that act as interpreters between Windows and your devices (video card, sound card, printer, keyboard, mouse, etc.). Why do I need the latest drivers? Sometimes Windows changes the way it speaks to hardware. Each time this happens, your drivers need to be updated so they can translate the new commands properly, and your devices will understand them. Also sometimes your devices need to learn to do new things. e.g. Your aging video card may need to be taught how to display a 3D drawing that was created with new technologies. To teach it, your video card manufacturer will simply release an updated driver that explains to your card how to display the new type of drawing. Without the latest driver, your video card will be unable to do it properly. Driver Easy is a tool that automatically updates all your drivers to the latest correct version, with just 2 clicks. It scans your computer, finds any devices with an outdated or missing driver, and automatically installs the right one for each. Can't I just update my drivers manually? Yes. But it’s very time-consuming and quite risky. First you have to figure out what drivers you need to update, and identify the manufacturer and model number of each. Then you have to visit the manufacturer’s website, and find their driver download page. Then you have to find the right driver for your device and operating system, and make sure it’s newer than the one you already have. Then you have to download and install it. And you have to do that for every single device your computer talks to, both inside and outside your PC. It can take hours – even days – and if you do something wrong, or install the wrong driver, your computer problems could get even worse! Doesn't Windows Update keep my drivers up to date? But all driver updates are important, even when Windows calls them ‘optional’. If they weren’t, the hardware manufacturers wouldn’t go to all the trouble of coding and releasing them. Sometimes these ‘optional’ updates include just a new, nice-to-have feature. And you can arguably do without that. But sometimes it’s an important bug fix – perhaps the old driver is causing your device to stop working or your computer to crash. Windows often categorizes these updates as ‘Critical’, but definitely not always. So when Windows fails to install a new ‘optional’ driver update, just because it has an older ‘critical’ one already installed, it’s doing you a disservice. You’re definitely missing out on functionality, and you may be suffering through completely unnecessary computer problems! Driver Easy works differently. It flags and installs ‘critical’ and ‘automatic’ driver updates, just like Windows. But it doesn’t stop there. Once they’re installed, it also installs the ‘optional’ driver updates whenever they’re available. And it does all of that automatically, for every device. So you know your drivers are always truly up-to-date, and you’re far less likely to experience computer problems. Can't I just check Windows Device Manager to see if I need to update my drivers? No. 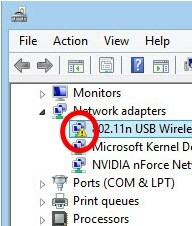 Windows Device Manager doesn’t tell you when a driver is out of date; it only tells you when a driver is missing or faulty. That’s what it means when you see this: Unfortunately, there’s no flag to tell you when the driver is simply out of date. To find out if Windows thinks a driver is out of date, you have to right-click on each device and click ‘Update driver’. (When you look at how many drivers your computer has, you’ll see why this isn’t a very friendly way of doing things…) And even when you do click ‘Update driver’ for every device, you’re still relying on Windows correctly identifying when a driver is out of date. Unfortunately, as described in the previous question, this is something Windows isn’t very good at. So even if you manually update every driver with Device Manager, you usually still won’t get the latest driver for every device. Driver Easy works differently. It flags and installs ‘critical’ and ‘automatic’ driver updates, just like Windows. But it doesn’t stop there. Once they’re installed, it also installs the ‘optional’ driver updates whenever they’re available. And it does all of that automatically, for every device. So you know your drivers are always truly up-to-date, and you’re far less likely to experience computer problems. Yes, of course. All our drivers come straight from your hardware manufacturer, and they’re all tested and certified, safe and secure. It won’t install anything dodgy in the background, either, nor will it try to trick you into installing some random antivirus program, or something else you don’t want or need. Does Driver Easy stay up to date? Yes! We update Driver Easy pretty much every day, with new drivers, new features and regular improvements to the user experience. There are two different versions for Driver Easy: a Free trial and paid Professional version. Visit our home page to compare these two versions. What does the paid version give me that the free version doesn't? Does Driver Easy collect any personally identifiable information? No. Driver Easy just looks at hardware and system software info to determine what drivers you need. Driver Easy supports the 32bit and 64bit versions of Windows 10, 8.1, 8, 7, Vista and XP. What if my devices are very old? Yes, Driver Easy supports even very old devices. We guarantee it will support your device, or your money back. Yes. Whether it’s a driver problem or you need help with Driver Easy, our Microsoft Certified Professional (MCP) support specialists will be happy to help. Usually they’ll get back to you within 1 business day, but during busy periods, it can take up to 2 business days. Definitely! We use MyCommerce services for our online order and payment processing. With its industry-leading technology, MyCommerce spares no efforts in providing you the most convenient & secure shopping experience online. During your payment process all data exchanged is SSL-secured. Your security and confidentiality are our top priorities. What if I'm not satisfied with Driver Easy? Driver Easy comes with a 100% money-back guarantee. If, for any reason, you’re unhappy with the program, simply send it back within 30 days, and we’ll give you a full refund, no questions asked. Step 1: Go to our purchase page: http://www.drivereasy.com/buy.php. Step 2: Choose the license type you want. Step 3: Go to the order page, choose your payment method, fill in the payment information and confirm your purchase. Step 4: Your license key will then be emailed to you (and displayed on the confirmation page). What's difference between a Professional License and Technician License? A Technician license is specially designed for computer repair shops or computer maintenance companies. You get just one license key, but you can install Driver Easy on up to 50 PCs, and use it for up to 3 days on each. You can extend your license to cover more PCs if you wish. A Professional license is for anyone else who wants the full suite of Driver Easy features. You can use it on up to 3 computers (whether personal or work computers) for up to 1 year, and you can install or uninstall it as many times as you want on those computers. Step 1: Click Start, which is at the bottom-left of the screen. Step 2: Through “All programs”, you can find the “Driver Easy” from the list, expand it, you should see the “Uninstall Driver Easy”, click it and follow the instruction to uninstall the program. Till now Driver Easy supports Windows XP, Windows Vista, Windows 7, Window 8, Windows 8.1 and Windows 10. Mac, Linux or other operating systems are still under discussion and research. Driver Easy Professional (Speed Limited) is not an official released version. It is a version that has been modified and released on the Internet by a third party, which, in some places, is called a cracked version. We believe the Professional (Speed Limited) version was provided by some people out of good faith, and there is currently no evidence showing that Professional (Speed Limited) version will damage your system. However, we have found out that some websites have repackaged Professional (Speed Limited), with a file size that has exceeded the size that it should be. We are unable to verify if these repackaged products include other harmful software, viruses or other malware. As we must pay for expensive server bandwidth fees, we can only offer the dedicate server with the paid Professional Version, for users to enjoy high-speed download services. All Professional (Speed Limited), Cracked and Free Version utilize a similar download server and bandwidth. Their speed is controlled on server side. We strongly recommend that you buy our paid version to enjoy high-speed download services.